Seven small dishes and two jasmine teas made up lunch for myself and my friend Graeme. The most expensive dish was £3.20 for four prawns dumplings served with salad cream. The meal cost £25.08 including service charge. The dishes included curried baby octopus, cuttle fish cakes, deep fried squid, steamed prawns dumplings, BBQ roast pork pastries and glutinous rice. 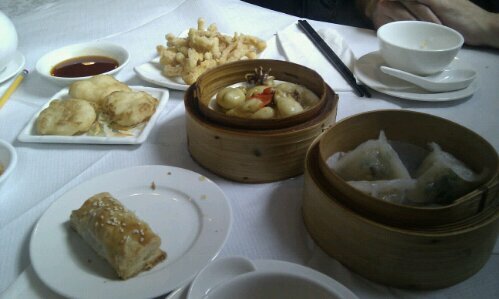 See also Dynasty, some thoughts on the dim sum. This entry was posted in Bristol, Food and tagged Bristol restaurants, Chinese Food, dim sum, Dynasty. Bookmark the permalink.